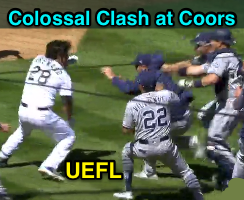 HP Umpire Brian Gorman ejected Padres pitcher Luis Perdomo (throwing at), Rockies 3B Nolan Arenado (charging the mound/fighting), Padres C AJ Ellis, Rockies P German Marquez, and LF Gerardo Parra (fighting/bench clearing brawl; all QOCU) in the bottom of the 3rd inning of the Padres-Rockies game. With none out and none on, Arenado took a first-pitch fastball from Perdomo for a called first ball. Replays indicate the 96-mph pitch was located chest-high and thrown behind Arenado, resulting in Arenado's charging the mound and bench-clearing incident during which the remaining three players were ejected for fighting, the call was irrecusable. At the time of the ejection, the game was tied, 0-0. The Rockies ultimately won the contest, 6-4. These are Brian Gorman (9)'s 2nd, 3rd, 4th, 5th, and 6th ejections of 2018. Brian Gorman now has 14 points in the UEFL Standings (4 Prev + 5*[2 MLB + 0 Irrecusable Call] = 14). Crew Chief Brian Gorman now has 6 points in Crew Division (1 Previous + 5*[1 Irrecusable Call] = 6). These are the 12th, 13th, 14th, 15th, and 16th ejections of the 2018 MLB regular season. These are the 6th, 7th, 8th, 9th, and 10th ejections of 2018. Prior to ejection, Arenado was 0-1 in the contest. Prior to ejection, Perdomo's line was 2.0 IP, 0 R. Marquez's line was 3.0 IP, 0 R.
Prior to ejection, Ellis was 0-1 (SO) in the contest. Prior to ejection, Parra was 1-2 in the contest. This is San Diego's 2/3rd ejection of 2018, T-1st in the NL West (COL, SD 3; ARI 2; LAD, SF 0). This is Colorado's 1/2/3rd ejection of 2018, T-1st in the NL West (COL, SD 3; ARI 2; LAD, SF 0). This is Luis Perdomo's first career MLB ejection. This is Nolan Arenado's first ejection since August 12, 2017 (Pat Hoberg; QOC = Y [Check Swing]). This is AJ Ellis' first ejection since May 29, 2015 (Mike Winters; QOC = Y [Balls/Strikes]). This is German Marquez's first career MLB ejection. This is Gerardo Parra's first ejection since July 29, 2010 (Adrian Johnson; QOC = Y [USC-NEC]). This is Brian Gorman's 2-6th ejection of 2018, 1st since April 9 (Andy Green; QOC = Y [Replay Review]).